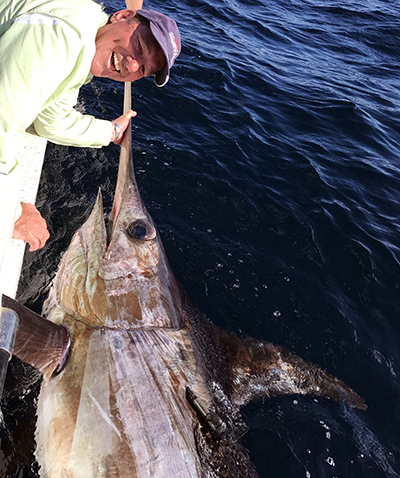 IGFA Representative Tim Simpson has followed a burning passion for huge fish and offshore game fishing since childhood. The pursuit has taken him throughout Australia and to all corners of the world including Hawaii, The Bahamas, Canada and Papua New Guinea. He’s chased everything from monster black marlin to broadbill swordfish in saltwater, and barramundi to brown trout in freshwater. Simpson is equally at home battling a 1,100-pound bluefin tuna on 130-pound tackle as he is up a bass creek with a baitcasting outfit. Simpson has worked as a professional crewman in many locations, including six seasons off Cairns. At the age of 20, his main profession was running two of Australia’s largest privately-owned specialist fishing tackle stores as manager, tackle designer and buyer for Compleat Angler. For 23 years he played an influential role in the development of many of Australia’s trends in fishing and tackle, including the design of rods, lures and other fishing tackle items. From the late 1970s until the demise of south-eastern Australia’s population of large yellowfin tuna, Tim made annual pilgrimages to Bermagui, catching yellowfin like this pair. 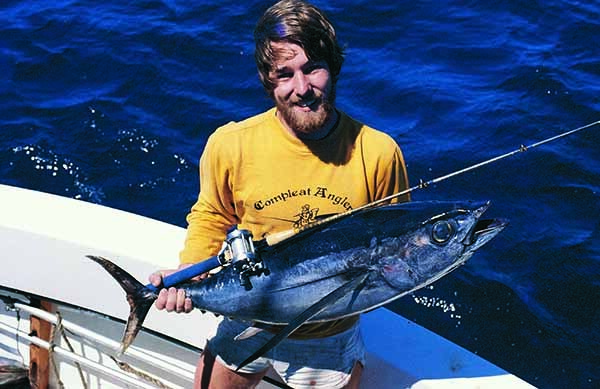 Fishing off Sydney in 1980, he broke the IGFA World Record for albacore with this 15.73-kilogram (34-pound 11-ounce) tuna on 3-kilogram (6-pound) baitcasting tackle. Throughout his years in retail, Simpson and his team took great pride in educating anglers in the techniques that would bring success. For more than 40 years he continued this teaching passion through regular lectures and demonstrations at clubs and boat shows, and in guest spots on several national and international TV fishing shows. He’s been a regular on Australia’s HiTide radio fishing show for more than 20 years and has presented fishing lectures on stage for the Sydney International Boat Show for more than 35 years. 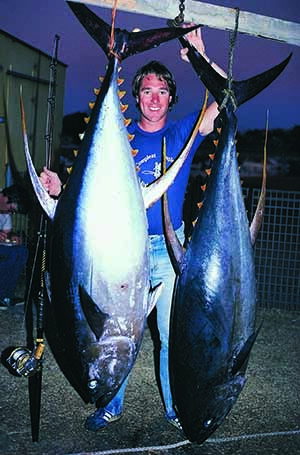 By the age of 23, Simpson had achieved five IGFA World Records, including the current All-Tackle World Record for longtail tuna. In 2009, he added another World Record for a 69-pound 10-ounce wahoo on 4- kilogram (8-pound) tackle. Simpson is also one of Australia’s most successful tag-and-release anglers, having released more than 580 marlin, swordfish, sailfish, shark, tuna and other game fish with scientific research tags, several of which have been recaptured. In 1988, he was awarded Australia’s national Tag-and- Release Champion in the bicentennial fishing competition. In 1978, Simpson was a founder of one of Australia’s most successful tag-and-release fishing clubs. Since then, he has been President, Secretary, Committee member and advisor to seven prominent game or sport fishing clubs. He is also a member of the IGFA’s angling rules advisory panel and is on the Board of Trustees for The Billfish Foundation. 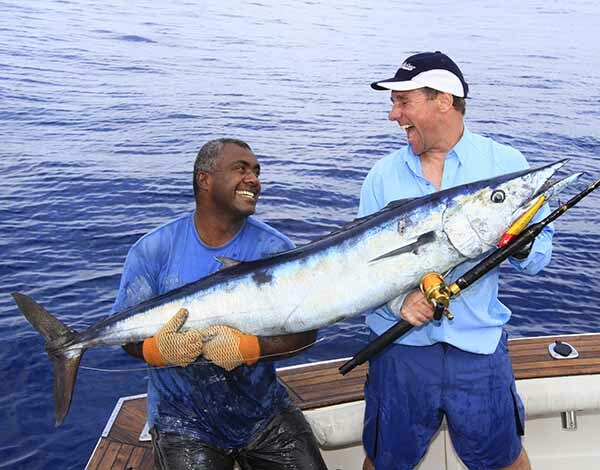 Tim made several trips to Fiji specifically chasing the IGFA World Record wahoo on 8-pound tackle, succeeding in 2009 with this 31.6-kilogram (69-pound 10-ounce) fish caught on a Halco ‘Laser Pro’ lure. Representing the IGFA and The Billfish Foundation, Tim was a guest judge for the Indonesian Government’s inaugural Widi International Fishing Tournament in 2017. At the lavish Opening and Presentation ceremonies, Tim presented several speeches to the heads of Indonesia’s government before a crowd of thousands. Simpson was appointed an advisor to the NSW Minister for Fisheries in 1996, a position he held through several terms until he moved to Queensland and took up a similar position for that State’s Fisheries Minister. He has also served in several positions for the Game Fishing Association of Australia including: Future Directions Committee, Rules Committee and as Chairman of a committee to develop a new pointscore system. Simpson has also been Chief Judge of the Sydney International Gamefishing Tournament, and a judge for the Indonesian Government’s Widi International Fishing Tournament in 2017. 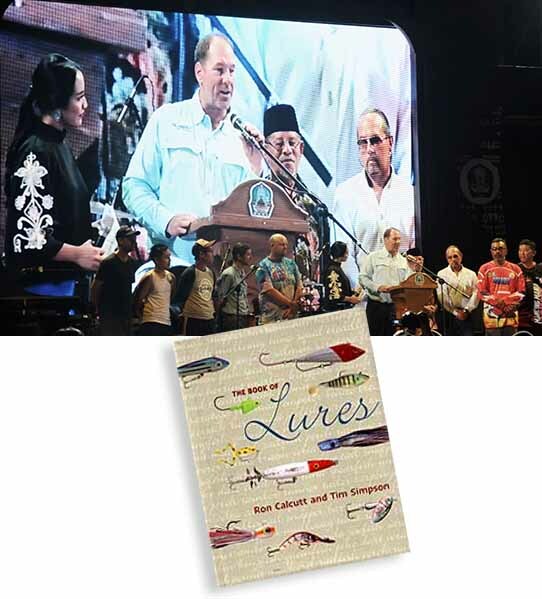 In 2004, Simpson co-authored The Book of Lures, a 320-word treatise describing the use and design of nearly every type of fishing lure in the world. This book identified the critical factors that make some lures highly-effective while others that look almost the same can hardly raise a fish. 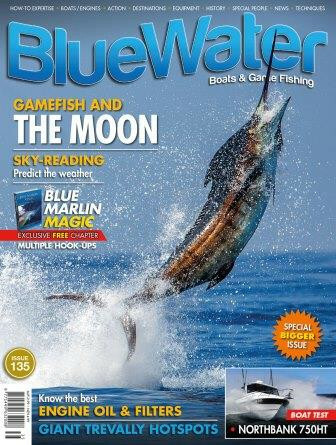 Then in 2005, Simpson took the job as Editor-in-Chief for BlueWater Boats & Game Fishing magazine, a glossy bi-monthly publication that details the art of offshore big game fishing. Packed with stunning photography, it details the expertise of the world’s best anglers, captains and mates, as well as the sport’s history, tackle innovations, the latest science, location guides and boat tests. With a devoted following of subscribers throughout Australia, New Zealand and around the world, he has used BlueWater to guide his readers in the principles and ethics of IGFA angling. He’s also strongly promoted tag-and-release, which is now a way of life for most Aussie and Kiwi game fishermen. In 2016, Simpson purchased the magazine business and now runs it as Editor-in-Chief and Publisher together with his wife Trish. 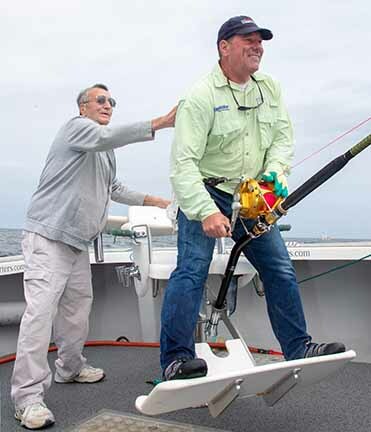 In 2018, Tim released an estimated 1100-pound Atlantic bluefin tuna off Canada’s Prince Edward Island, with his friend Ken Fraser – the holder of the All-Tackle World Record bluefin – guiding the chair. Between issues, Simpson still travels the world’s game fishing hotspots with his camera, on a mission to capture the expertise of the leaders in the sport, then deliver it into the hands of his BlueWater readers. As a side-interest to his fishing pursuits, for more than three decades Simpson has collected vintage and antique fishing tackle and literature. He is now an authority on the subject and has a massive collection of rare and historic rods, reels, lures, accessories and books. Fishing on the bottom in 1500-feet of water off Tasmania in 2017, Tim released this estimated 650-pound swordfish with a satellite tag after a 5-hour battle on stand-up 60-kilogram (130-pound) tackle. Simpson is currently developing a series of online digital courses to teach the skills of offshore game fishing to shorten an angler’s learning curve, while potentially saving them many thousands of dollars along the way.